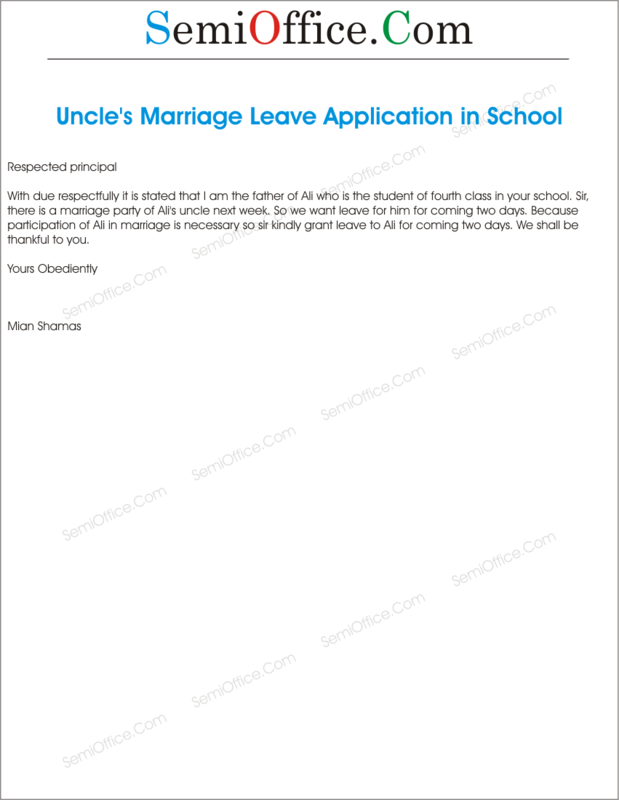 Sample leave application to attend the marriage of uncle by the parents of students to school principal or headmaster. With due respectfully it is stated that I am the father of Ali who is the student of fourth class in your school. Sir, there is a marriage party of Ali’s uncle next week. So we want leave for him for coming two days. Because participation of Ali in marriage is necessary so sir kindly grant leave to Ali for coming two days. We shall be thankful to you. This application is to request a leave application of two days. Due to marriage of my brother we all are going out of the town to attend his marriage ceremony. This would take about two days. As our presence is necessary in the ceremony, so I request to provide a leave of two days to my son. He would surely complete his work within two days after his arrival. Sir, my son is Patrick Neil and he is a student of 7th grade at your respectable institution. As you know that marriages are of immense importance in our culture and it is considered as an obligation for relatives to attend such events. Therefore, we would like you to grant a leave application for 6 days i.e. 6th December to 12th December so that he can attend his Uncle’s marriage ceremony that is in another state. We would be very thankful to you. With due reverence, it is stated that my son is student of 8th grade in your school. It is to inform you that he cannot attend classes today. That is because he has to attend a marriage ceremony of my brother i.e. his uncle. All of our family is travelling to another city to attend that marriage. It is therefore requested that leave for 3 days be granted to him. I hope that in the light of reason mentioned above you will accept our request.